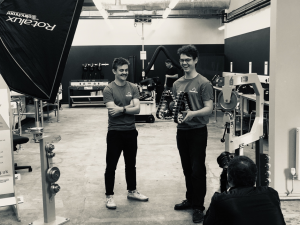 STEAMmates: Jack Cornes and Harry Smith– both STEAMhouse members; an engineer, an entrepreneur and their wall painting robot. 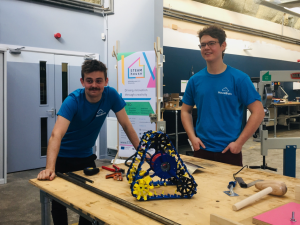 We’ve caught up with Jack and Harry to see how STEAMhouse is benefiting entrepreneurs in the region. Hi guys, thanks for taking the time out of your project to speak with us today, can you tell us a little about yourself and what you are working on? We’re both from a tiny village in Rutland, it’s the only county in the UK without a McDonalds in it, most people haven’t heard of it. We went to school together and have been friends ever since. Harry went to university to study engineering at Loughborough and I (Jack) worked in a London at a start-up and had some sales jobs. In Harry’s A-levels he came up with his first drawings of a painting robot. About a year ago the project wasn’t moving anywhere fast, so we decided to team up – Harry doing all of the clever engineering stuff and me doing the business side; marketing, sales etc, and here we are now. We chose Birmingham because it’s affordable and the best city for us to be based to start a venture. Our office is based in the Custard Factory, just down the road from STEAMhouse. We’re trying to automate painting and decorating, starting with dangerous and expensive parts, painting big buildings. It’s amazing that in 2019 people are still using scaffolding, we are aiming to make it safer to paint using robots. Harry was paintings living room – bored out of his mind – so he did the drawings of a robot that could do it for him. It was just a fun idea at first but the more we researched it, the more we realised that it was a real-life problem. 42,000 people fell from a height whilst painting and decorating last year, a large portion of which are professionals. Everyone knows how boring painting is, it’s also a dangerous job which can be made safer. So, what is it you are looking to achieve? 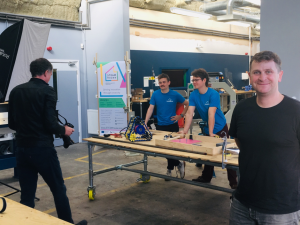 We’re still in the prototyping stage so we have a few goals: Onsite trials – we’ve got partnerships with painting, decorating and construction companies in Birmingham, two months into that and we’ll test to see if it works in the real world. Next, we will take the feedback and make the robot more intelligent, mobile and be able to paint more things. Then we’ll launch the product into the public for use in tool hire companies so Hausbots will be available to rent. Our five-to-eight-year goal is to be Europe’s number one automated painting company, to be known as the people who made painting faster, smarter and safer. We look forward to seeing that become a reality. Can you tell us how STEAMhouse came into your thinking? It was quite accidental, we walked past a few times and could see all the amazing kit through the window. have a project called HLSM (Higher Level Skills Match), so we got linked through that. They helped us with hiring people and recommended STEAMhouse, we got introduced to Jon Colen and we went from there. We needed kit to make, prototype and test things and STEAMhouse is a great place for it. It’s a great place to make a mess – which we can’t do in the office! Everywhere we go we shout about it. 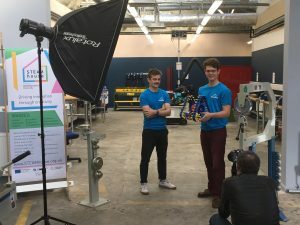 We’re a part of the robotics start-up community in the UK, most of them don’t have the space to make, test and prototype things and STEAMhouse is the first thing I tell them – to move to Birmingham and join STEAMhouse! has organised for us to see a lecturer at BCU to investigate manufacturing methods. Chris has also made a test rig with us, we’re building a wall in STEAMhouse, not like Donald Trump but to test different angles, gradients and materials. The thing we use STEAMhouse for currently is to make changes to our prototype using expensive kit that we can’t do elsewhere. We do metalwork testing, we could use other metal workshops in Digbeth but it would be too expensive and slow, STEAMhouse allows us to use expensive kit that we otherwise wouldn’t have access to. 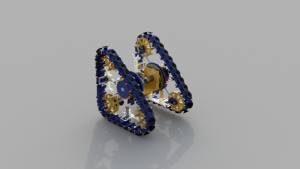 Finishing off all the test rigs and finishing all the designs. STEAMhouse are helping us tweak the design so it’s ready for manufacturing. Many innovators don’t always care about the finance or the business side, if you don’t have those strengths, find someone who does – innovation needs to be supported with a business plan, sales, marketing, finance, if it is to be successful. Look for a co-founder with skills and strengths which are different to yours. It will mean giving up equity on your idea but 100% of a business worth nothing is nothing but 50% of a business worth £10m is £5m. It’s worth thinking about. I honestly can’t sing STEAMhouse’s praises enough, we can’t believe there is this place in Birmingham that is free to use for everyone. It’s the magic ingredient – if you’re making a product, you don’t want to be anywhere else other than Birmingham and STEAMhouse. Thanks Jack and Harry, we look forward to seeing what unfolds for you and your work.